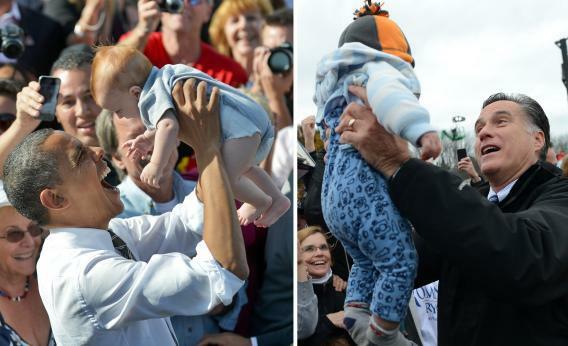 Fertility rates and the election: What happens if liberals start having more babies? What Happens If Liberals Start Having More Babies? Sorry, Fox News. It’s not just single women who are voting their vaginas. Turns out, it’s everyone. Lauren Sandler, writing for The Cut, takes a fascinating look at how strongly fertility rates per state correlated with voting patterns this election. 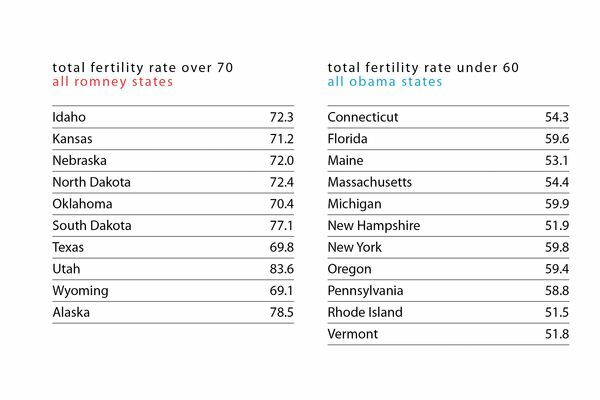 States with over 70 births per 1,000 reproductive age-women per year all went for Romney, and states with under 60 per 1,000 all supported Obama. Sandler takes her cues from Ron Lesthaeghe, a Belgian demographer who is working on the Second Demographic Transition project, which examines how the postponement of marriage and procreation—and the rise in cohabitation—is more concentrated in some parts of the country, and what this says about the red state/blue state ideological and cultural divide. Higher fertility in red states, for instance, is the product of the societal pressure on women there to marry young, have more children, and put less of their energy into developing careers. In blue states, on the other hand, women tend to limit their family size and have kids later in life. Lesthaeghe clearly believes that ideology precedes family size in this equation. Liberals care less about traditional roles for women and traditional authority, which in turn gives blue state women room to focus on their careers rather than marrying young or having big families. But don’t buy the conservative hype linking ideology to family stability. Red states have higher incidences of teen births and divorce, after all, demonstrating that David Brooks couldn’t be more wrong when he writes: People are not better off when they are given maximum personal freedom to do what they want. They’re better off when they are enshrouded in commitments that transcend personal choice—commitments to family, God, craft and country. Conservative preferences for a particular family structure has little to do with improved outcomes, and is more the result of a continuing respect for religious and cultural authorities that more liberal communities are moving away from. (To give Brooks credit, he does go on to say that “the two-parent family is obviously not the only way people bind themselves.”) It’s the greater stability in blue family life that causes Sandler to wonder if the strong link between higher fertility and voting Republican will soon start to crumble. After all, one major reason people put off having kids is they fear that they can’t afford them and therefore won’t be able to raise them properly. Take away the cultural pressure to have children out of some sort of societal duty, and affordability looms even larger as an issue in the decision-making process. Because of this, some Western European countries have experimented with expanding the economic support system for parents. France has found that government support that makes it easier for women to have kids and work has led to higher fertility. The implementation of Obamacare and the economy’s continued recovery could ease economic concerns about the future for liberal women who feel they have more choices, which could, in turn, raise the fertility rates in blue states. Right now, conservatives are having more kids. But a few tweaks to the social safety net that make the prospect of having children more attractive, and liberals might catch up to them.